Apologies for missing last week’s tip! My approach to Friday became unstabilised, so I’ve completed a go-around and here I am back for another landing. This one should stick! 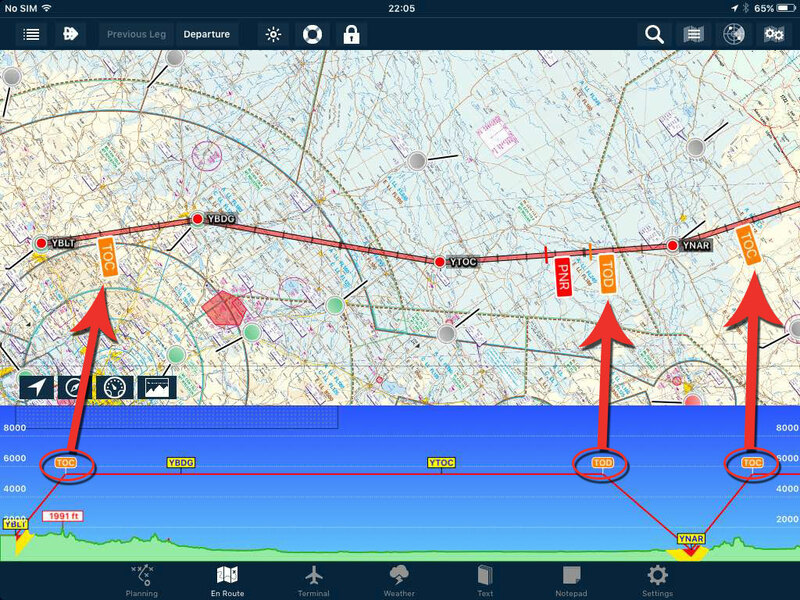 Route Annotations – These little signposts posted along your flight plan route can give you some important information about your vertical navigation and be a decision making tool. Firstly, how to turn them on: From the EnRoute pane, tap the Map Settings icon (top right, two cogs). 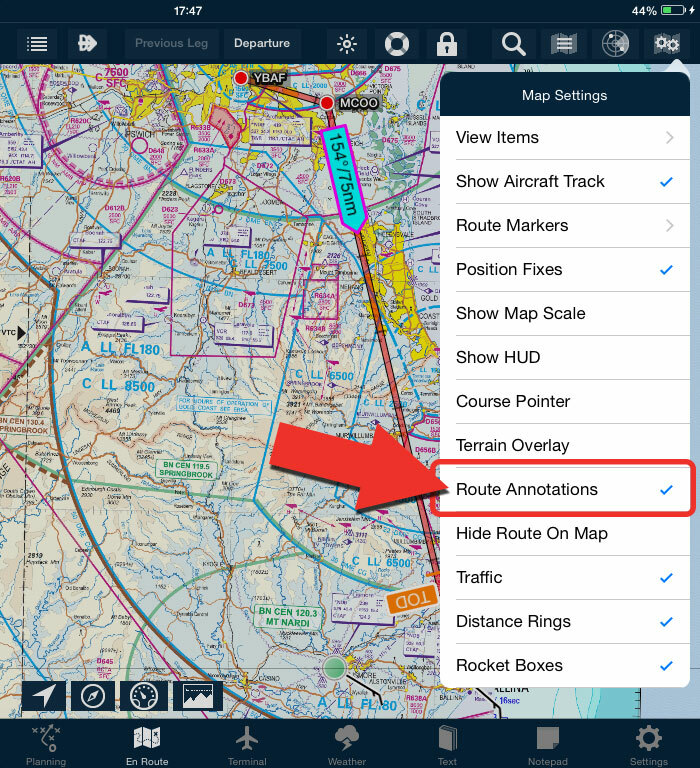 Then from the list, ensure Route Annotations has a blue tick against it. “I have a route, but I still don’t see them!” I hear you say? 2) Fuel must have been loaded on your aircraft in the Planning > Aircraft Loading/Weight and Balance/Fuel Planning page (in order to see Point of No Return). The Top of Climb and the Top of Descent are calculated using the data provided in your Aircraft Profile. For example, if your aircraft cruise-climbs at around 600 feet per minute, make sure your profile reflects this for accurate TOC calculations. The descent is the same. 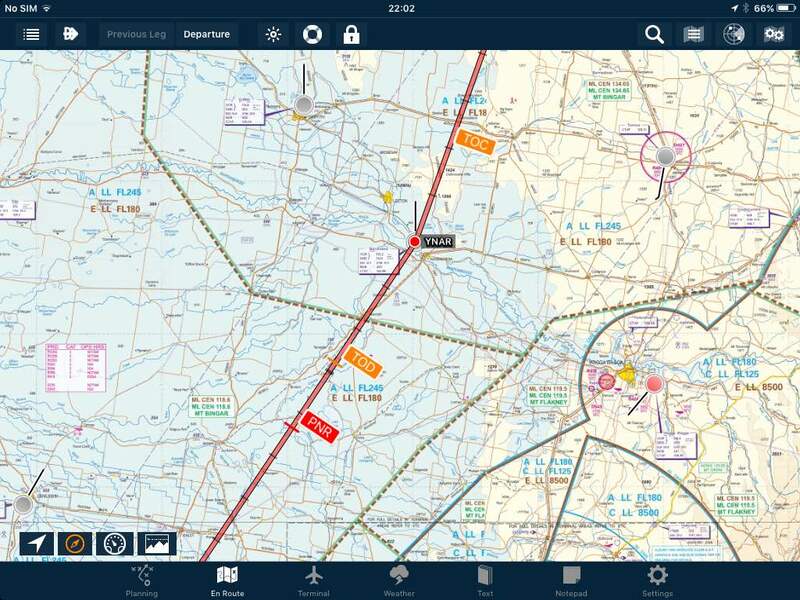 When you are flying along and reach TOD, set your aircraft up in a descent similar to that in the profile. I usually set up a nice and comfortable 500 feet per minute descent, so that’s reflected in my aircraft profile, and therefore my flight plans. The Point of No Return is the point along the stage of your flight plan that with the fuel load upon takeoff, you can fly to, turn around and return to your stage departure airport. This can become a decision making tool, especially if you are flying over large bodies of water, for example. A PNR may not be displayed along your route if you can easily make it all the way to your arrival airport and back to your original departure with that stage’s fuel load on board. If you have a stepped climb planned within your flight plan, the TOC will display at the point you would reach your highest planned cruise altitude. So, turn these on. They are a very handy help to vertical navigation!